Scientific name for Blackline Penguinfish (Thayeria obliqua). In the Class of Ray-finned fishes (Actinopterygii). 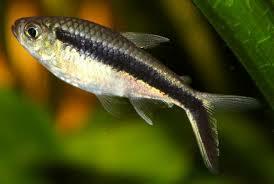 The blackline penguinfish is called other names as false penguin tetra and Boehlke’s penguinfish. Blackline Penguinfish is a freshwater fish with a characteristic appearance, an old acquaintance of aquarium. This provides it with a special note of any community aquarium. If you want a fish that is active and looking good, then the Penguinfish might be the ideal choice. Blackline Penguinfish is native to South America specifically to Amazon, but also lives in Peru and West Brazil. Live in quiet waters rich in vegetation. It is a small fish: it doesn't reach more than 2 1/4 to 3 inches (6.0 to 7.6cm) in length. Its body is fusiform and slightly flattened on the edges. Lower branch swimmers feature a longer tail. Specific color is the who gave the name of the Blackline Penguinfish. Full body is the longitude traversed by a blackline, from opercule to the tail, where it finishes on top of the lower branch of the tail. Black stripe edges gets golden reflections, resulting in an attractive contrast. The body is colored as follows: above the black line, the scales have a yellow glow golden and silver and gray lower stands. Fins are transparent. Blackline Penguinfish prefers soft water which is slightly acidic. In captivity they do well when water is maintained at pH range from 6.0 - 8.0, and DH range from 5 - 19 pelagic. They are quite sensitive to fluctuations in water parameters and especially to ammonia and nitrates. Make sure to keep the aquarium clean and well filtered. Average temperature should be of 73 to 82 degrees Fahrenheit (22.7 to 27.7 degrees Celsius). They are card so as pets in an aquarium the fish need a large tank 25 gallon tank (100 liters for a group of 8 to 10 fish). They are not shy fish so they need not to hide. However the aquarium should be moderately planted, leaving enough space for swimming because they are energetic and active fish. They swim mainly at the top and on the median edge of the aquarium. They feel best in groups so make sure to purchase at least 6 fish. Ideal would be to own a card of 10 -14 fish, they will feel safe and perform better. Omnivorous species such as Blackline Penguinfish prefer live food, but can be fed with frozen or dry food (pellets). Occasionally a plant food intake is more than welcome.